Mockups of Apple’s upcoming iPhone 8 began hitting the web a few weeks ago. Then, last week we saw the first high-quality hands-on video appear, showcasing one of these built-to-scale iPhone 8 models. Now a new video has hit the web, and it provides yet another deep dive into what is believed to be the iPhone 8’s final design. 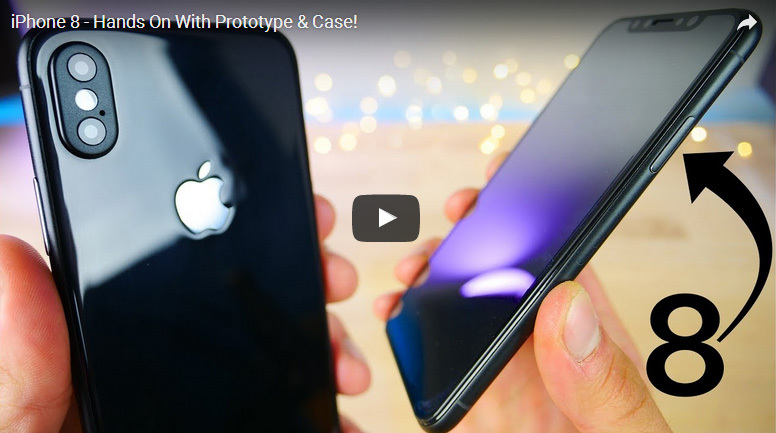 This time around, it’s GizOK YouTube channel got its hands on one of the iPhone 8 models that have been floating around. These aren’t cheap plastic dummy phones, mind you. Instead, Chinese factories have taken leaked iPhone 8 CAD files and used them to create models made of glass and metal that likely look and feel almost like the real thing Apple will unveil in September. Now, it should be beyond obvious that this iPhone 8 model hasn’t been assembled using genuine Apple parts. While the overall look is likely very close to the real thing considering it’s made of actual glass and metal, the refinement simply isn’t there. The Apple logo on the back of the phone appears to be recessed for some reason, which obviously won’t be the case on the real iPhone 8. The rear camera also appears to be a bit different from what we’ve seen in leaks. The overall look and size of the device and its design features all appear to be good representations of Apple’s upcoming phone, however. Apple is expected to unveil its new iPhone 8 alongside the iPhone 7s and iPhone 7s Plus this coming September.